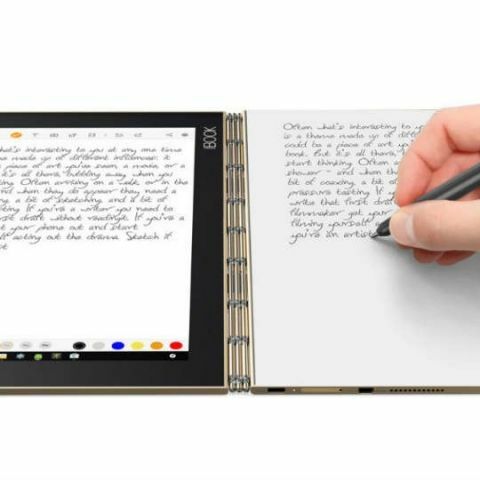 Lenovo Yoga Book, the tablet hybrid will launch in India on December 13. The company has sent out media invites for an event where the company will announce its hybrid tablet with a never seen before design. Lenovo Yoga Book running Android or Windows was first showcased at IFA 2016. Lenovo says Yoga Book is the thinnest laptop hybrid and it is unlike anything else available in the market. Under the heart of Lenovo Yoga Book is an uninspiring Intel Atom x5-Z8550 processor, which Lenovo finds as a common thread in the world of Android and Windows. The device features a 10.1-inch IPS LED display with a full HD resolution of 1920 x 1200 pixels. The interesting part, however, is the other half of the device which basically skips traditional keyboard for a Halo effect. Yes, the keyboard is literally called Halo keyboard and it appears on demand, similar to the virtual keyboard on your smartphone. Lenovo Yoga Book's Halo surface also accepts Pen input which allows users to sketch, draw and make use of it like a real notebook. To keep things working, Yoga Book comes with 4GB RAM and up to 64GB storage. Lenovo Yoga Book is backed by a decent 8500mAh battery. Lenovo has rolled out Android version of the device globally with Windows variant coming out soon. It is unclear whether we will have both variants or just the Android. One thing is certainly clear, Lenovo Yoga Book is one of the most innovative devices launches of 2016.